What is Slingo the game? It’s an exciting, addictive and very popular fusion of slots and bingo. The free-to-play game is played on a 5x5 grid that’s similar to a standard 75-ball bingo card. Beneath the grid is the slot reel and the aim of the game is to spin the reel to get numbers that match the ones on your grid. In a typical game, you’re allowed a maximum of 20 spins and the first 16 are free. To get more, you have to cash in points or free spins that you’ve earned by playing the game. There are several symbols that may come up on the reel; these symbols can cross off numbers or give you points. The main way to earn points is by completing horizontal, vertical or diagonal lines. The real-money version of Slingo is called Slingo Riches. There are lots of differences between ordinary Slingo and the real-money Slingo Riches; the main one is that when playing Slingo Riches, you have a maximum of 15 spins, with only the first 11 free. What is Slingo the casino? Slingo also refers to the online casino that was developed by the company that created the Slingo game, Gaming Realms. This casino just happens to be called Slingo as well. The casino not only offers Slingo Riches, but also Slingo Extreme, which is a more thrilling and advanced version of the game that has a massive £50,000 jackpot. Slingo has a VIP scheme, though the website doesn’t reveal exactly how you can become a VIP. If you do manage to become a VIP, you can look forward to additional benefits such as a dedicated account manager, express withdrawals, exclusive promotions, special gifts, surprise account boosts and 5% weekly cashback. 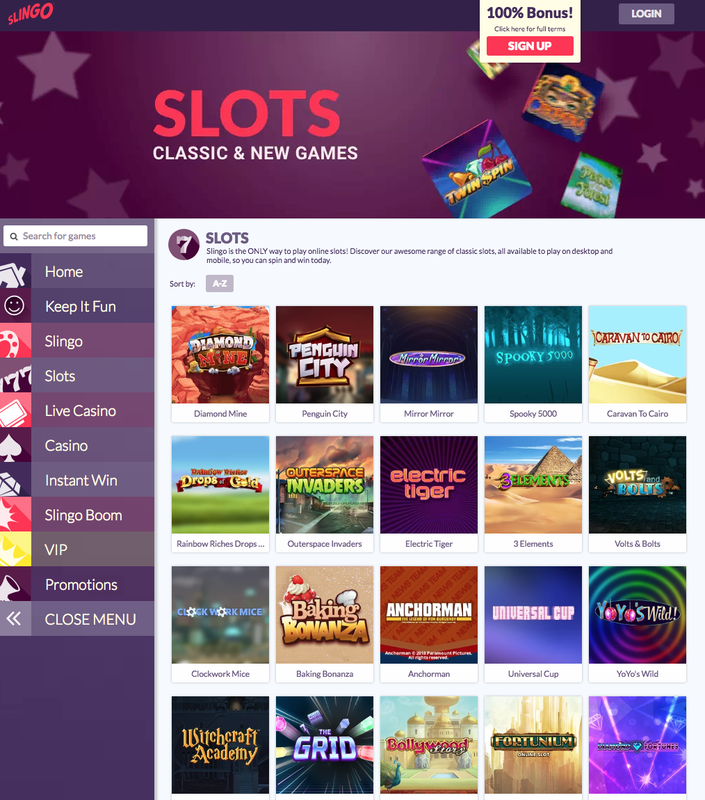 All of the games available at the Slingo casino are fully compatible with desktop computers, smartphones and tablets. Slingo is based in St Peter Port, Guernsey, and is regulated and licensed by the Alderney Gambling Control Commission. The company’s UK gambling services are licensed by the UK Gambling Commission. If you wish to get in touch with the staff at Slingo, you can do so every day of the week from 9am to 11pm. You can use the live chat feature or contact the company by phone or email.